I really don't consider myself a perfume snob. Yes, I do favor quite a few fancy niche fragrances, but my tastes still run the gamut. Case in point: I've loved Calvin Klein Euphoria ever since its launch in 2005. I remember making a visit to Lord & Taylor during a lunch break, spraying some Euphoria on my arm, and swooning in delight. I couldn't wait to describe my reaction on MakeupAlley that evening: "Oh my! I felt as though I'd been kissed." So now, more than a decade later, we have the latest Euphoria flanker: Deep Euphoria, described as a floral chypre with a "signature of sensuality and modern femininity" and "a smooth, sensual texture." (Whatever that means.) Its composition (developed by perfumer Honorine Blanc) includes notes of Cascalone, white pepper, mandarin leaves, "black magic rose," peony, jasmine, musk and patchouli. Its promotional ads feature actress Margot Robbie dreaming or fantasizing about a neon-lit loft party populated by numerous shirtless young men, so it seems designed to conjure up a mood that's hedonistic as well as euphoric. I actually like the slightly dirty seawater effect of Cascalone here, even as it's followed by the very clean musk and modern patchouli in Deep Euphoria's base. Not surprisingly, there's nothing going on that I'd describe as a proper "chypre." The fragrance's development goes linear and a bit flat over time, leaving an oceanic/wood dry down with average staying power on my skin. Despite its come-hither, morning-after commercial, Deep Euphoria could be worn to most workplaces just as easily as to a party. Deep Euphoria doesn't feel particularly "deep," and I wouldn't have guessed its relationship to Euphoria if I smelled it out of context, but I'm enjoying it enough to use up my sample vial. It's not a conventionally feminine mainstream fragrance, yet reviewers on the Sephora website seem to like it so far; maybe it will do well and stick around, unlike most other Euphoria flankers? Well, euphoria itself tends to be fleeting, so only time will tell. 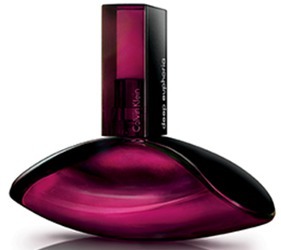 Calvin Klein Deep Euphoria is available as 30 ($54), 50 ($72) and 100 ($92) ml Eau de Parfum. A rollerball and matching body products are also available. I bought a bottle of the original for my sister when it first came out. We loved it. Then she used it to cover up her underage smoking habit. I actually don’t hold that against it, though. My biggest problem with Euphoria is that it first scale well. 1-2 sprays, great! 3-4, pretty neat. 5+, I’m suffocating. I should say, I’m ready to try this one. hah! Like many fragrances out there, it can be overdone. I find that two-three spritzes works well for me, although I avoid it in hot weather. Not sure about this flanker, but thanks to your review, I would like to smell Euphoria again. I think it was dismissed by many fragophiles as an Angel knock-off when it was released, but I never found it all that similar — much more red fruit, and no chocolate, and much smoother patch and amber. I hope you’ll revisit it! Thanks for the review, Jessica! I also loved the original Euphoria when it first came out, and still have my bottle. It smells like something expensive on me. Not too sure about this flanker, though, since peony is one of my “trouble” notes. I love reading reviews of perfumes that are available locally. Thank you. Off to sniff. My daily itinerary has shifted, so I’m more likely to be stopping into a Sephora than Barneys or Aedes these days…and my reviews may reflect that change! ‘Cascalone’ is only one syllable away from calone. Calone usually makes me want to chew off an arm. Need I be afraid? hah! I noticed that too, so I was a bit leery. I’m not generally a Calone fan, although I was back in the 90s (like everyone else). This particular “oceanic” note feels a little darker to me, and not melon-like. It’s not really “deep,” but it’s not a Calone smellalike, either!